Arlington’s steel and non metallic TV Box™ series provides installers easy and flexible options for mounting flat screen TVs and other devices flush against the wall. With options available in one through four-gang, as well as specialty sizes, we’re sure to have the right product to meet or exceed your project requirements. 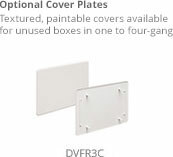 Included are textured, paintable non-metallic trim plates - and install for both new or existing construction. Browse our large selection below, or contact us for assistance. Either way, we’re sure to provide an innovative solution for your unique installation needs. Our steel TV Box is designed for use in commercial construction and where metal raceway is used, and provides both power and/or low voltage. Our recessed design keeps plugs and connectors inside the box. Connections don’t extend past the wall, so flat screen TVs mount flush. Available in two, three, and four-gang options. Try our TVB613 (non-metallic) or TVBS613 (steel). Its double-gang design allows you to install two duplex receptacles or low voltage devices. Or, use the supplied box separator to install one low voltage device and one duplex device receptacle. 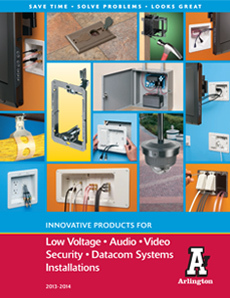 There’s also two built-in mounts for low voltage, data, or media connections. Does your project call for unique installation requirements? We have you covered. With models available for shallow walls, angled boxes, and our large 8” by 10” TV Box, we’re sure to have the right product to suit your needs. 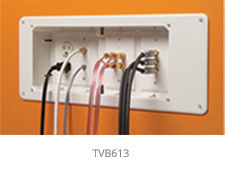 Our large TVBU810 accepts standard style plates with receptacles and decorator-style devices with plates. The mounting wing screw hold the box secure against the wall. Plus, our TVBU810 mounts both vertically or horizontally for even greater flexibility. Arlington's recessed non-metallic combination power and low voltage TV BOX™ Kit includes all you need to mount a flat screen TV secure and flush against the wall. The box offer power in one side and low voltage in the other for Class 2 wiring of satellite or cable TV, speakers, and more. 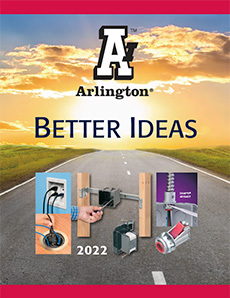 Arlington’s new non-metallic TV Bridge™ II box kits include two boxes and the necessary connections needed to install the TV and additional components.